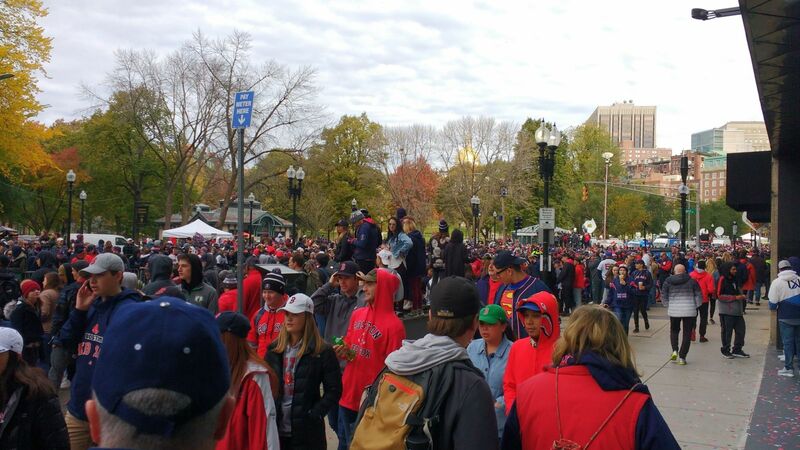 The Red Sox won the World Series on the road, so my tentative plan to be a Cheapskate and lurk the Fenway environs in anticipation of a fourth win proved impractical. 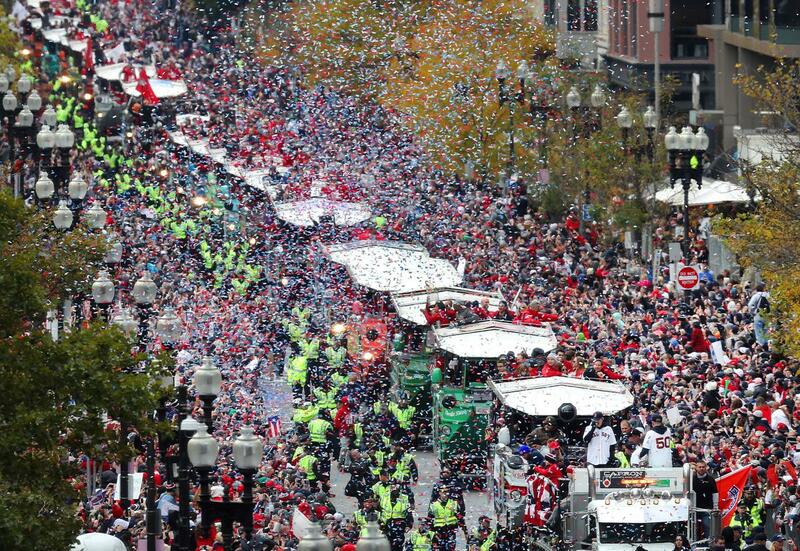 Next best thing was to pencil in Wednesday the 31st, when a parade in the team's honor was scheduled. I'm not good at guessing crowd sizes, but I'll go with 200,000. If someone in authority tells me it was 50,000, I'll think that was low but go with it. If they tell me it's 1 million, I'll think, wow, I had no idea. 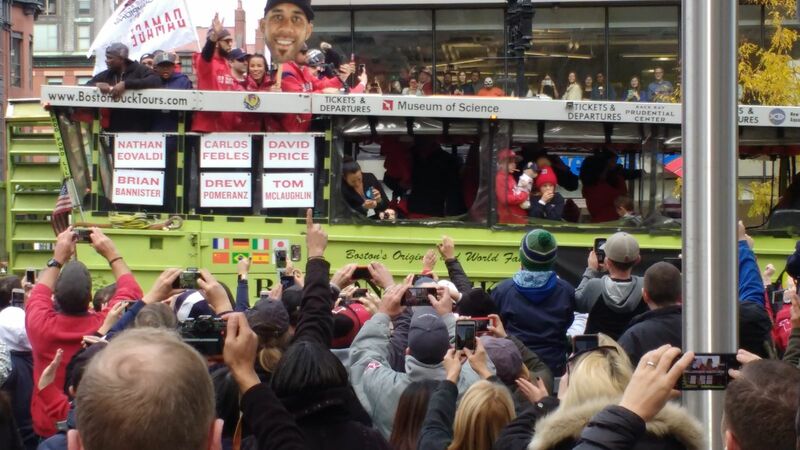 Bottom line, though, there was just a huge crowd lining the entire parade route. 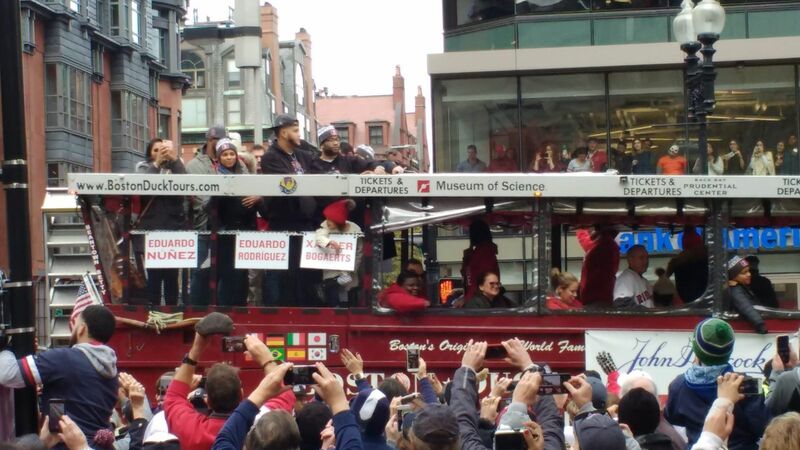 I figured I'd go all the way into South Station (most everyone on my train skipped Fenway and got off at Back Bay) and then work my way back toward Fenway, and pick a reasonably uncrowded spot to wait for the parade. That didn't work - wall to wall people at the Common and beyond, so I circled back by side streets and met up with the parade at Back Bay, near the train stop I wanted anyway. I bailed out perhaps a few minutes early, to catch the noon train. It was kind of luck-of-the-draw which side of the vehicle each given player was waving from, and even with names on the sides I'm still not sure who was who. Is Eduardo Nunez wearing glasses? This one is pretty definitely David Price, unless someone tells me it isn't. Season over. I am ready for the Arizona Fall League.